The security systems for preventing the theft are necessary in order to reduce thieve. Generally, they protect themselves by covery their faces during the actions. 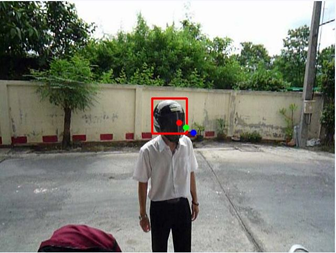 Therefore, this project try to apply the image processing technology to develop system for detect a person wearing the cloak, which is normally the motorcycle helmet is used. This project use haar-like training and hough circle transform to distinguish between who wear helmets and those not wearing helmets. It can be detected more than 70.00 percent.